For these posts in Japan I actually wrote the bulk of the text during downtime (train/plane/bus journeys and late evenings mostly) so I could have a nice way to properly look back on my honeymoon. Red. I have seen more of this colour in the last few days than I think I have in the rest of the year. It’s obviously a very important colour here in Japan, but today it’s something that really struck me. 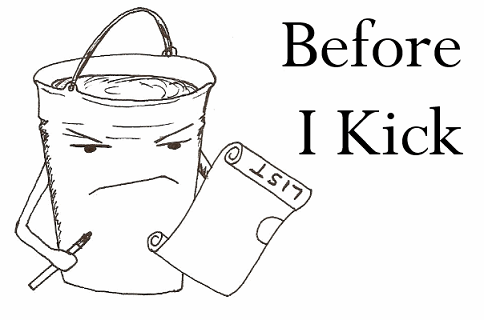 Anyway, starting at the beginning. 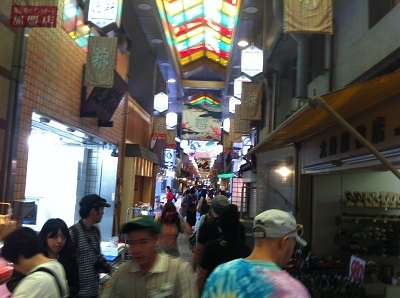 Nishiki Market! 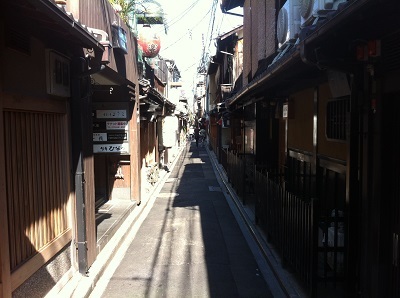 Since our hotel is just off of Shijo Road (a major road for shopping) we are remarkable close to the most famous market in Kyoto. With so many sights and smells and wonderful things to buy I was in my element really early on today. Once again the problem arose – what to eat for breakfast! 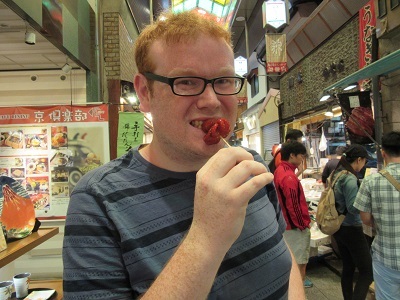 So I settled for a whole baby octopus on a stick with a quail’s egg stuffed inside its head. It was so good! Hubby decided not to indulge, something about no baby octopuses for breakfast. I dunno. Men! At the end of the street was a shrine with a rather lovely bronze pig inside. It’s getting to the point now where I am no longer surprised by the sudden appearance of a shrine. It’s starting to feel a bit normal, although I will still go in there and have a proper tourist noseabout. 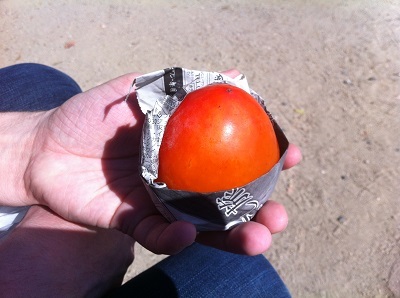 Yesterday I got my persimmons mixed around and bought a Fuya persimmon (that is so like me). That was nice enough, but this ripe Hachiya was so much better. When not properly ripe the Hachiya is meant to be firm and highly astringent. 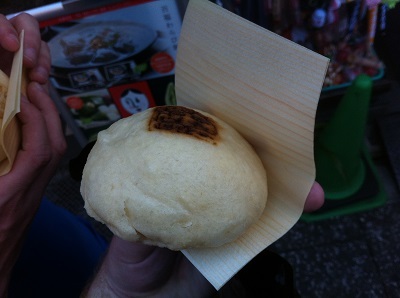 This one that I purchased in Nishiki was really soft, so I felt confident as I just bit right into it. It was so sweet and juicy! You could tell that in the past there was some astringency there… but honeyed sweetness overpowered everything. 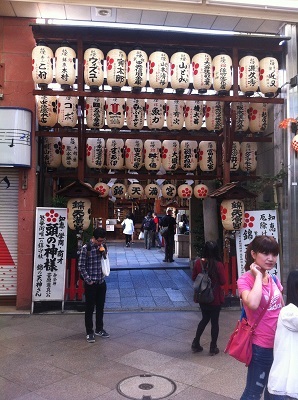 It was after the Gion district that we started racking up the temple and shrines starting with the Yasaka Shrine complex. It just boggles my mind not only how big these shrines can be, but just how many of them are here in Kyoto. Probably why Kyoto is a major spiritual centre within Japan. They are also a huge money making opportunity. I’m just not talking about the hairy man that was in the complex selling rather large crab legs on a stick, but the number of charms and other such items that are sold in these shrines. At some point I should buy some as a souvenir, also there are times where I need help finding lost things. The shrine connected to a really beautiful park called Maruyama Park, this connected Yasaka Shrine with the neighbouring Chion-in Temple. 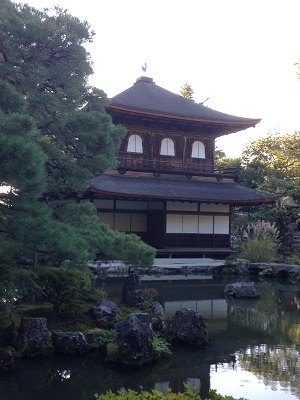 Now, if the entrance is anything to go by, Chion-in Temple must be absolutely massive. Sadly, it was under a serious case of building repairs so I didn’t get s chance to see it in all its glory. We had a look around the grounds and saw a rather lovely looking Buddha… which was outdone rather quickly. 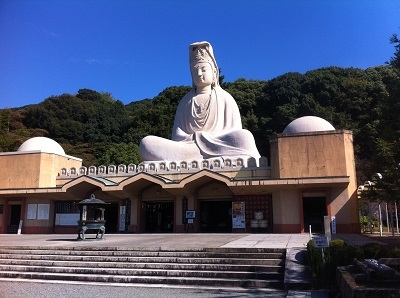 The Ryozen-Kannon is a huge concrete and steel Buddha that acts as the centre of a memorial to the 2 million Japanese soldiers that died in World War Two. When we went in we were given a lit incense stick each to place at the foot of the Buddha to show respect. Considering that this manifestation of Buddha represents compassion this is a truly beautiful way to remember them. 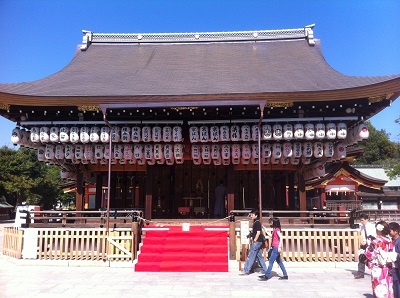 A brief visit to the Hokanji Temple was next. There was a plaque that said how inside this pagoda structure are some bones from the Buddha and that this version of the building is from 1440. All I can say is that it looks amazing despite being nearly being 800 years old. 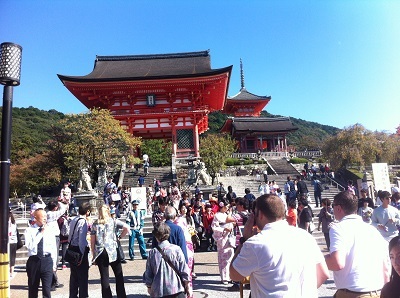 Now, the Kiyomizu-dera Temple was one of those many places that was on my original list of places to see. Ever since it was a finalist in a New7Wonders vote a few years ago. 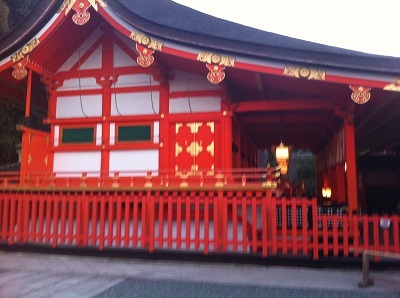 The building is massive, and the complex is (like with the Yasaka Shrine) huge. One of the many things I have really come to respect about Shintoism and Buddhism is how well they co-exist together. The complexes tend to festive elements of each other’s religions and that’s really how it should be. 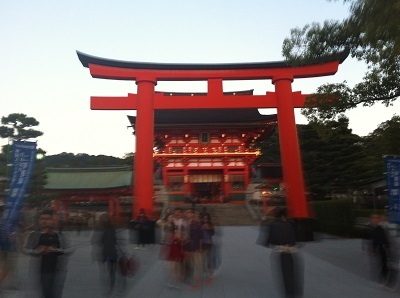 The Kiyomizu-dera is best when observed in a way that just enhances the hanging over. The way that it just juts out into the forest looks lame what surreal. Borrowed scenery is a phrase I saw to describe this. We were now quite a bit after lunchtime and hunger was creeping up on both of us. Seeing how snack food is in great supply whenever you are near a major temple/shrine in Kyoto we agreed to try some of these. 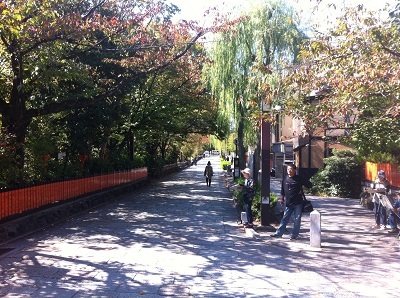 The first was on the walk between Kiyomizu-dera and the nearest bus-stop. A ‘special beef’ dumpling flavoured with gobo (dried burdock root) was the first on the menu. Now, apparently it is rude in Japan to eat and walk… and I wish I had know this as it would have explained some of the looks I was getting. A 20 minute bus ride later we were on the Philosophers Walk up to Ginkakuji Temple (also known as the Silver Temple). 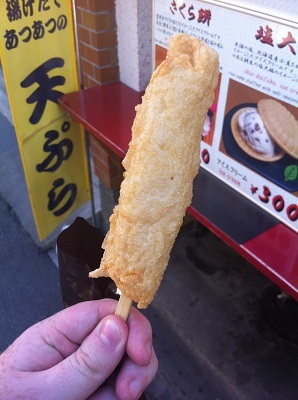 Yuba, or tofu skin, is something I have seen all around Kyoto so I am guessing that this is a regional thing. All I can say is that they made for the perfect wrapper for this fish paste cake on a stick. The Silver Temple is a misnomer because it is not, nor has it ever been, properly silver. It was meant to be but, you know, wars happen. Going here had another meaning for us since it was the basis of the Silver Pavilion in the Pokémon Gold and Silver games. There is even a bird at the top that looks like Ho-Oh. 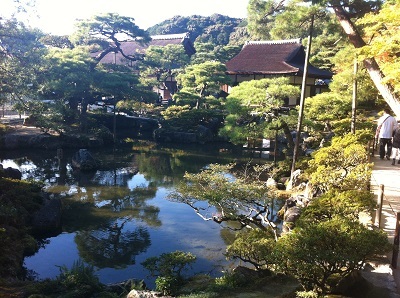 The gardens of Ginkakuji were immaculate. 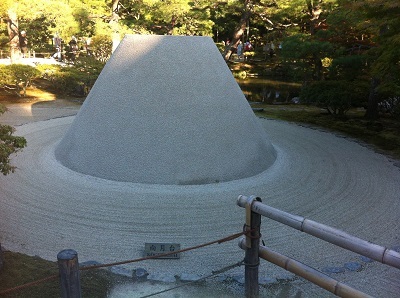 Sand was raked into perfect mounds and waves, there was a huge bamboo growth at the back and it has a number of scenic ponds. So much work has clearly gone into making it look so “natural”. 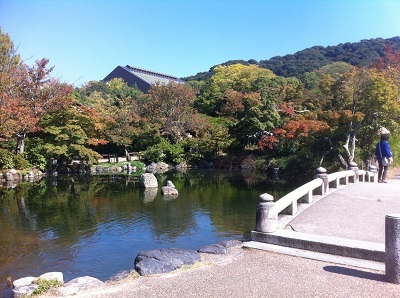 Now, by the time we were done at Ginkakuji it was about 4 o’clock. Most shrines and temples close at 5, most that is. Thanks to a tip-off on the Something Awful forum we knew there was a good place to be at sunset. We just needed to get to Kyoto Train Station and travel two stops South. 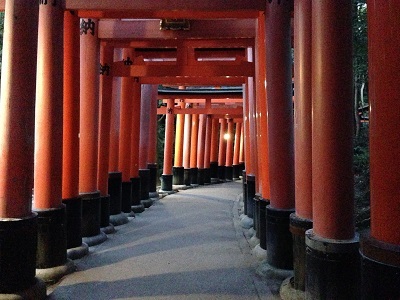 The Fushimi Inari Taisha is one of those places that, now that I have been there, strongly believe should have been in the Lonely Planet guide. To experience it at sunset is something that I will not easily forget. At the foot of Mount Inari, the shrine complex is awash with vermillion and is already incredibly beautiful (interestingly, it has a series of tri-lingual flags indicating how well reviewed it is on TripAdvisor). The star of the show are the torii. The many thousands of you that form a tunnel on the many paths that wind up the mountain. There are just so many of them in very different states of repair. Some are brand new, others are in need of a fresh coat of paint and then there are those where the wood has begun to rot. 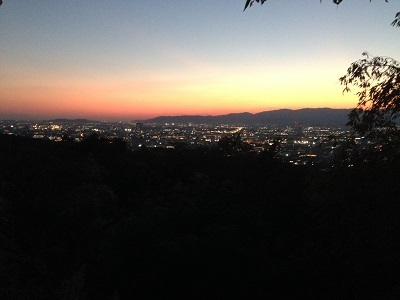 We quickly made our way up through the first paths to catch sight of the sun as it was setting over Kyoto. The picture doesn’t do justice to it to be perfectly honest, but how do you get a picture of a sunset on an iPhone that isn’t the latest model? Not actually that easy. In total we must have spent an hour and a half walking up and down parts of this mountain with the torii acting as our guide. We were even doing this on the pitch black of the mountain with only lanterns dotted along the way to provide us with light. The crickets were so loud… and then there were some animals whose noises I couldn’t identify and really did not want to find out what they were (of course my first thought went to a pissed off tengu). Dinner time in Kyoto! My first pick for a place to eat was shut because it was a Monday (boo!) but I did find us a brilliant sushi place! Sushi as a concept has been ruined for me by visiting Japan. I used to love my very occasional trips to Yo Sushi. That’s going to taste so plain after this holiday. 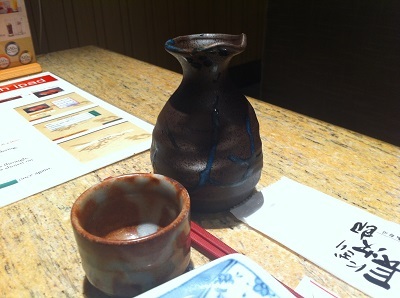 Hubby ordered himself a sake (I got a Sprite) and I tried some for he sake of research. It has been a while since I last had hot alcohol, and this was pretty strong. I just stuck with my Sprite and the free green tea. 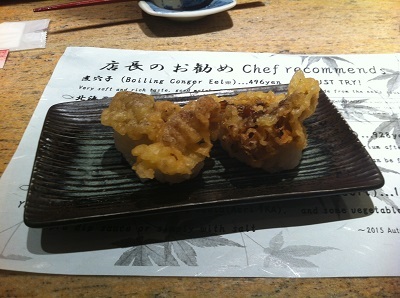 The first of three list foods up for grabs was maiitake in tempura form. This went on to become one of our favourites of the night alongside a rather nice eel and fried shrimp roll. For a mushroom it tasted faintly sweet, and the texture was well preserved despite being, essentially, deep fried. Now, in Britain these pieces of sushi would be so extremely expensive. I think that together these were 950¥ or £5. It’s pretty damned crazy. The abalone was nice and fresh (nothing much more than nice to be honest), but I was surprised at how hard it was to bite through in places. Them bluefin tuna was a true revelation. No more tuna from a can! 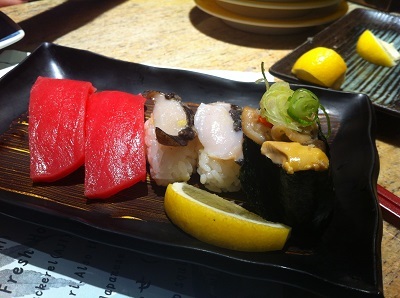 This bluefin was so soft, mild and meaty. A bit like the Kobe beef for fish. If I can find it on our next sushi trip I will be going for more. We are still eating, but approaching full, when I saw something that made me lose my appetite: fish prepared in the ikezukuri style i.e. alive sushi. I could tell it was still alive because the tail would flap occasionally and it looked like the head was gasping for air as it moved from side to side. Not only did I lose my appetite, but I just wanted to be out of there as soon as possible whilst people were taking video of this poor fish not their phones. Since we were still a bit hungry we grabbed a small burger from the Japanese chain Mosburger on our way home (really nice for a burger chain) and hubby got some radioactive looking melon Fanta. Wow, it’s been a busy day. A lot of sleep will be needed before we tackle the next one.